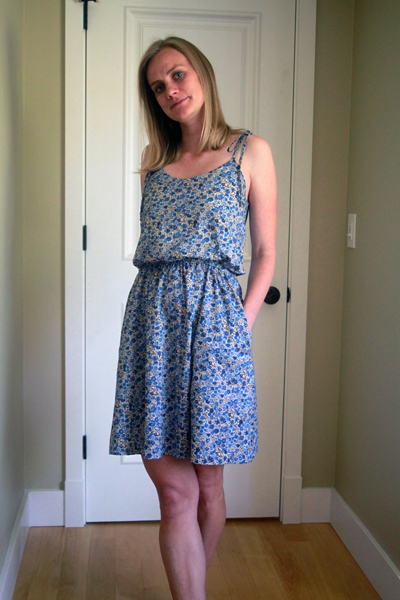 Have you seen Sewaholic‘s most recent pattern release, the Saltspring Dress? I was one of the lucky pattern testers, and I fear I’ve lost my job as I couldn’t really find anything off about the pattern. 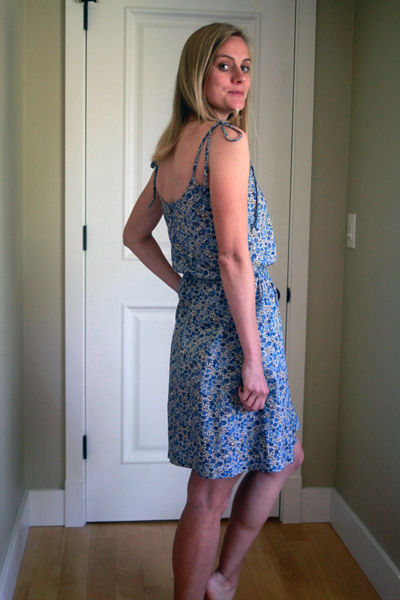 I made mine in a Liberty of London cotton lawn that I got from Tessuti‘s online remnants section ages ago. Because it was a remnant, I barely had enough to make the knee-length version. In fact, the lining is a white cotton I had in my stash. It doesn’t show though, so no one will be the wiser! Here are some close ups to show off both the lines of the dress and the beautiful Liberty of London fabric. I just love the scoop of the neckline. Not too sweet, not too plain. There are no darts. The shaping comes from the clever drafting of the lining and the gathering at the waist. And, look, pockets! The back closes with a zipper and is constructed in such a way as to keep much of the blousing of the back outer fabric even through the center seam. Though I made sure to match my zipper, I didn’t think to topstitch in a darker thread. Oh well. I’ll say it’s a design feature! Look at the cute little bow at the shoulder! Though, while I like it, I may just cut the straps to length when I make this dress next. And, I’ll leave you with the teeniest tiniest little baby bump. I can only imagine how I’ll be laughing about calling this a baby bump after several more months! 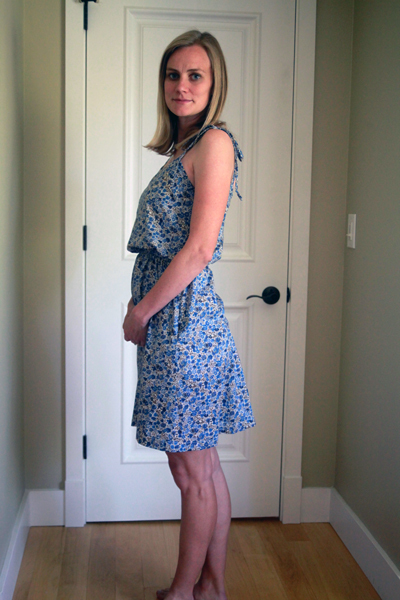 UPDATE: My dress was featured on Tessuti’s blog. Pretty cool! Previous Post SA Curve Ruler: Review and Discount! Congratulations for your baby bump, so exciting!!! I love this dress, I think I’m definitely going to have to add it to the list. Thanks for the inspiration. Thank you! And, definitely add this dress to your list. It’s a fun make, pretty quick. And super cute for summer. I also think it allows for some easy modification, like the straps and blousing and such. You are a wonderful ambassador for this pattern – gorgeous. And you’re pregnant!!!! Huge congratulations. Hope you’re feeling okay. Thank you! And, I’m feeling pretty okay. I can’t run as much as I used to (or as fast! ), and food can be an enemy (my eyes want so much, but my stomach can handle so little! ), but I’m grateful that it’s all signs that things are keeping on keeping on. I was hoping things would ease up now that I’m in my second trimester, but so far it hasn’t quite let up! Anyway, thanks again! congrats on your little bump! :)) i’ve been thinking of you,after reading your tweet a few months back.What a great start of your new life in Seattle! 🙂 Ps. the looks fab with your eyes/hair color! Thanks so much for thinking of me these past few months! It’s been quite a roller coaster, but that’s how these things go sometimes. Hopefully the third time is the charm! It’ll be fun to build a life in Seattle with a little one! congratulations on the baby news.. the dress its adorable on you! Love your dress. One of my favorites! Congratulations on the baby. I was thinking this might make a good early paternity dress for you! Looks gorgeous! I think it’s a great piece for lots of shapes, but the elastic hits right at a point for me to show off the teeny tiny bump I’m growing. These days I have no waist! It’s super comfortable (and super cute, in my opinion)! 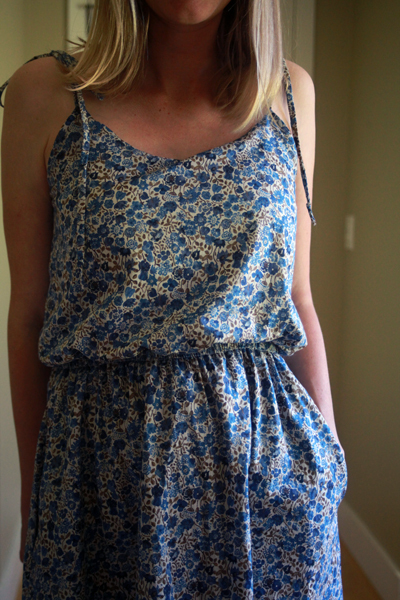 very pretty, perfect summer dress. cute bump! What a lovely version of the dress, and CONGRATULATIONS!! Many congrats on the baby, Amy!! How exciting! And that is a cute dress. I know I’m suppose to comment about the dress but nix that! Congratulations! This is wonderful and exciting news! I’m so happy for you and the hubby!!! Thank you! Hopefully MSN will be up for some maternity sewing over the next several months!!! This is so cute! Amy I love it, I really love that fabric and I love the fit of this dress- flattering and feminine, yet comfortable looking. Also baby bump!?? Congratulations!!! You make pregnancy look so cute. Congratulations to you all on the precious little one!!! You’re going to love being a sewing momma :)! Thanks for the great review too. Blessings! Thank you! Thank you! I’m excited to be a sewing mama. I hope I can balance it all. I see a lot of great examples in the sewing blog world to emulate though, so I’m ever hopeful that I’ll be able to make it all work! Congratulations on your wonderful news! Hope you are feeling well. And a lovely dress! Thank you! I’m feeling mostly well. I’m into my second trimester, which I was hoping would mean I’d get some energy back and be able to eat without as many problems, but it seems, if so, a bit of normalcy is coming back very, very slowly. Oh well! I figure it’s all signs that the pregnancy is keeping on keeping on, which is a very good thing! Wonderful news and a sweet dress! Congrats! CongratS, What A Wonderful News! Thank you! We are quite excited about the news. Slightly cautious excitement since we’ve had a couple false starts… Though, well, actually, nope, just really excited! Congratulations on both the baby and the dress! Congratulations!!! The dress looks lovely. So very pretty and summery! Love the blue floral fabric on you too 🙂 Super impressed at the effort it would have taken to make the straps and binding! It wasn’t so bad to make the straps. I just used a safety pin to turn them. Now, had I had one of those fancy tube turners that my local sewing store in the Bay Area was always raving about, then I bet those little straps would have been turned in seconds! Yay baby bump! You will be laughing at how fast your bump will grow!!! Congratulations!!!! The dress is beautiful! So cute- is a blue dress an indicator of who’s to come? Hahaha! We’ve decided to let it be a big surprise at the end… But, my subconscious could be telling me something! When I first saw this pattern I thought about using Liberty and you’ve shown me it works perfectly! I love your version. Congratulations! I thought of Liberty right away, too! And, it does work. Tasia doesn’t have lightweight cottons on her list of recommended fabrics, but she does say “lightweight wovens…” so I figured it was worth a shot. 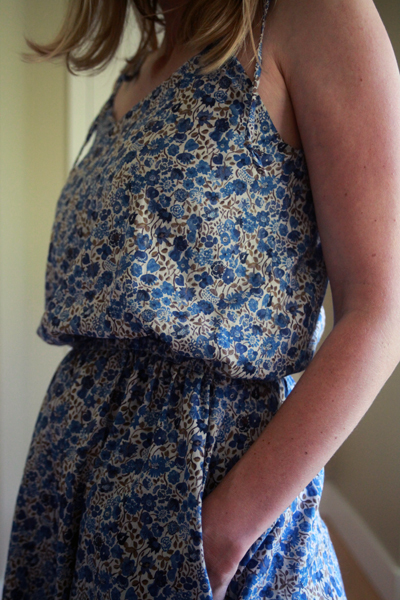 Maybe it’s not quite as drapey as hers, but it works, it’s comfortable, and I just love the print on a sundress like this. You should definitely go for a Liberty. If you make the shorter version, you can get by with very little fabric! Congratulations!!!! SaltSpring is def on my to-buy list. It looks lovely on you and its great you were able to squeeze it out of that lovely remnant. All of Tasia’s patterns are on my to-buy list!!! I think this would be a great dress on you. Go for it! Absolutely EVERYthing about this dress is perfect on you! And it should even grow with your bump for awhile too! I’m hoping I can wear it for awhile, too. That stretchy waist does stretch quite a bit! I just need Seattle to cooperate and continue to have sundress weather! Hi Colette, I just sent you an email, but yes, you are more than welcome to share this dress on your blog. I was so smitten with this fabric (and its price! ), I had to have it shipped across the world! Crazy that that’s possible. This is so lovely! The fabric is a perfect match for the pattern– great eye! You look so pretty! Beautiful! And good luck with the pregnancy… Having gone through infertility and miscarriage, I know some of the emotions – fearful, heartwrenching, afraid to be excited yet so excited… I am thinking positive thoughts for you and The Bump. Oh, Amy, congratulations!! What wonderful news. This dress works perfectly for this stage of pregnancy it seems. 🙂 I’d consider this dress (a nice alternative from fitted ones I usually buy), but since it’s getting to the end of the summer I might hold out until next year. Love your version! I was so busy gushing over how beautiful this dress is, I totally had to do a double take with your baby announcement – congratulations!! I love the baby bump! 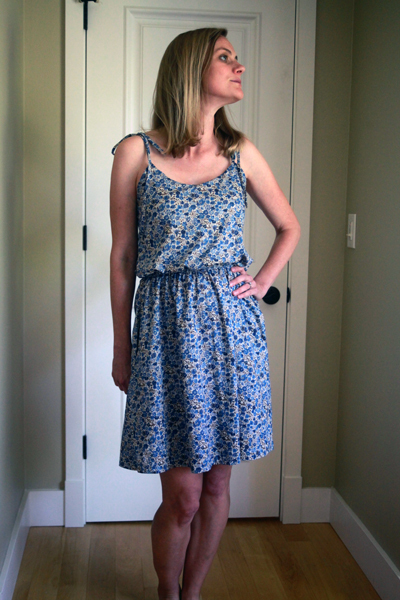 And I’m thrilled to see a version of the dress in cotton lawn. I want to sew mine in a cotton but wasn’t sure how it would work. Now that I see yours, I’m definitely going for it!